Rod Argent Interview: "It Sounds Completely Bananas, but It Feels like the Zombies Are an Emerging Rock Group"
Originally formed in the early 1960s, iconic British psychedelic pop group the Zombies recently released their sixth studio album, Still Got That Hunger, which was well-received on the Billboard charts. 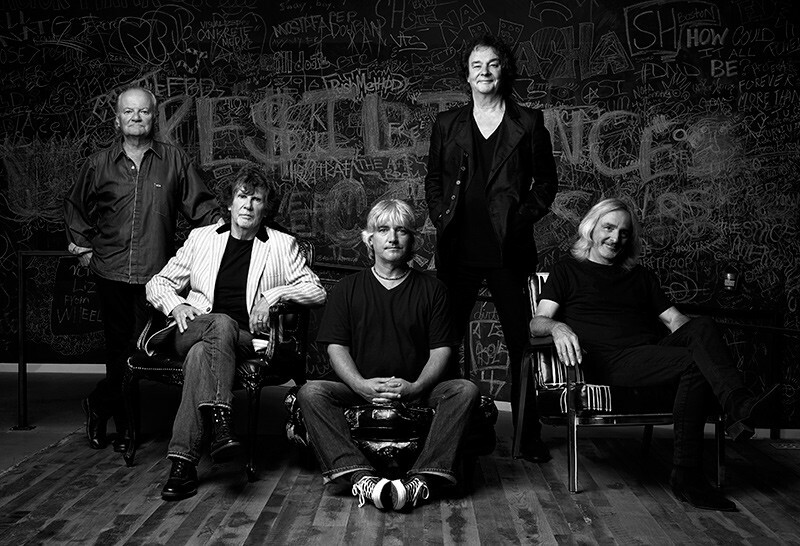 The current lineup of the Zombies features founding members Rod Argent (keyboards) and Colin Blunstone (vocals), along with Jim Rodford on bass, Jim’s son Steve Rodford on drums and guitarist Tom Toomey. To this day, generations of new bands have cited the Zombies’ work as pop touchstones, and the band continues to be embraced by new generations of fans. In addition to his work with the band, Argent also had a successful solo career, played keyboard with a number of musicians and formed a production company. Melissa Parker (Smashing Interviews Magazine): Rod, I understand a charity event was instrumental in bringing the Zombies back together? Rod Argent: Well, I’ve always been involved with music and always produced and recorded with other bands. I’ve written music scores for TV films. But I thought that I wasn’t going to be playing live seriously really anymore. Then a jazz musician friend of mine, John Dankworth, who’s sadly passed away now, was putting on a charity show back in 1999. He asked me to put an evening together to raise money, and I did so. Colin was in the audience, and he got up on the spur of the moment and sang “She’s Not There” and “Time of the Season.” It felt so nice. A little while afterward, Colin said, “Look. Why don’t we put a little band together and do some gigs for fun.” We weren’t thinking about the Zombies at all. We did that, and it felt so great that we just kept going. In a very slow way, we gradually started doing more and more gigs. We started traveling to different places. We started to embrace some old material because we thought, “Wow! There’s a whole load of Zombie stuff that we never played live. This is a chance to actually investigate some of that material.” It finally got to the point where we felt right about actually calling ourselves the Zombies again. We never tried to create the band at all in the first place. We just got a great band together and had a ball playing. More and more we moved into the space that we used to be in naturally, so we started calling ourselves the Zombies again. That’s how it all came about. Melissa Parker (Smashing Interviews Magazine): The new album, Still Got That Hunger, is really good. Rod Argent: Thank you. We’re very proud of it. We recorded it very much in the way that we used to record stuff in the old days. We were all in a room together, playing and singing live vocals. The whole experience turned out so well. The solos that we thought we were going to look at in minute detail the following week worked so well and spontaneously reacted to all the other musicians in the band that we didn’t even repeat any of the solos. We just worked on some extra production details and worked on the backing harmonies the following week. The majority of the stuff was done the way we did it in the old days, but we had no choice in those days. You had to record like that. It was a great experience, a very live way of recording and very energizing. Melissa Parker (Smashing Interviews Magazine): Were you trying to recreate the old sounds or perhaps have a mixture of old and new? Rod Argent: No. We didn’t think in those terms at all. We just tried to be natural. I wrote nine of the ten songs. If an idea came to me, I started working on it and didn’t think beyond that point. We never tried to copy, in any way, or recreate the old stuff. We just tried to take a musical idea and then work on it until it started to excite us, until we really felt like we were making it work. Then we tried to capture some of that excitement during the performance in the studio. It was so much about capturing the performance the way we were feeling about things. That’s how we approached this record, and that’s exactly how we’d do it in the old days. We never used to think about trying to copy a particular sound. We never used to say, “What’s really commercial at the moment is this, so we’ll try and record something in that way.” We never did that. We just tried to get excited about a musical idea and follow that through. That’s exactly what we were doing with this album. I guess the fact that Colin used to sing my songs in the old days and the fact that I was writing the majority of the new material, we were recording in a very natural way. There are quite a lot of resonances from a long time ago there. It’s not at all anything we were trying for. It’s just a natural result. It sounds like a record made today, but I think there are resonances of how we used to play. We’re the same people. We have the same creative imagination, although a lot of years have passed, and we’ve learned a lot in the interim. I think that Colin is singing as well as he’s ever sung, and I played better than I’ve every played. Therefore, it feels like the right thing to do. Melissa Parker (Smashing Interviews Magazine): I love the psychedelic album cover. It was painted by Terry Quirk who did the cover for Odessey and Oracle. That brings me to the fact that Odessey and Oracle ranked #100 on Rolling Stone’s list of the “500 Greatest Albums of All Time.” Why did it take so long for that record to find the critical acclaim it deserved? Rod Argent: That was an extraordinary surprise to us because for the first twelve years or so that it was out nobody listened to it. Certainly nobody bought it (laughs). Then suddenly people like Paul Weller, Tom Petty and many emerging, young, independent artists started talking about it, and they do right up to the present day. The album has started to have a second life. In fact, it sells more every year now than it ever did when it first came out. That was something I never thought would happen, and it’s very gratifying. It’s very flattering. We have a lot of young people that like that record that come to our concerts. It’s very gratifying to feel that some of the stuff we did then still seems to relate to people not just our age, but people in their teens, twenties and thirties as well. That was something that was a wonderful surprise to us. Melissa Parker (Smashing Interviews Magazine): Influential Yes keyboardist, Rick Wakeman, said that your organ solo on “Hold Your Head Up” was the greatest organ solo ever. Rod Argent: He actually said that, at one point, to me! Rick’s got a radio show over here. We went up to be on his program, and he played “Hold Your Head Up.” On air as we were there, he said, “In my opinion, that’s the greatest organ solo on any record I’ve ever heard!” I said, “Wow! That’s absolutely wonderful.” It’s a huge compliment. We’ve run across Rick quite a few times recently, and it’s always great seeing him. He’s a great talent. To have somebody like him say that is a huge compliment. I’m so grateful to him. Melissa Parker (Smashing Interviews Magazine): I believe you were sixteen years old when the Zombies were formed, signed with a label and had a hit with “She’s Not There.” As a teenager, did you seriously think about this career choice, or were you just being young and foolish? Rod Argent: I think some of the guys in the band saw it that way, but for me, music was the only thing I wanted to do. I always remember what John Lennon said when he was growing up that “music was the real world.” That’s exactly how I felt about things. Reality was rooted in music. I desperately wanted to be in a band at that point. I wanted to make music my life. I know that Colin saw it just as something that would last for a year or two. I came from a very working class family. We lived in a council house. I was always musical naturally when I was a kid, but my mother steered me very much in the direction of music. She got me involved in a very fine church choir when I was a kid which was a wonderful introduction to a whole world of classical music. She was very keen that I should be exposed to all that which was quite unusual from a working class household at the time. I got a scholarship to one of the schools we call public school which is the opposite of your public schools. They would be called private schools in America. The reason they’re called “public” is because in the 16th century, for the very first time, the general public were able to go to schools. Up until that time, they were only for the clergy. That’s why they were called public schools, and they’ve lasted for hundreds of years. Even though my parents didn’t make much money, they made huge sacrifices to put me through a really good educational system. When it was time for me to leave because we had a chance to go professional, I deliberately applied to the university too late to get in that year because I desperately wanted to be in the band. That’s what I wanted my career to be. That was my feeling. Melissa Parker (Smashing Interviews Magazine): And you had your parents total support at that age? Rod Argent: My parents were great, considering they sacrificed a lot to put me on a certain path. They asked me, “Are you sure this is really what you want to do?” I said, “Yes.” They said, “Okay. We support you a hundred percent.” My parents were really brilliant. My dad worked as a semi-professional pianist, and he, like a lot of people in his generation, thought rock and roll was a passing fad that would only last for a couple of years. Of course, it has lasted longer than any form of popular music (laughs). But that was their take on it. They were incredibly supportive, which I’ve always been very grateful for. Melissa Parker (Smashing Interviews Magazine): The world has lost so many influential musical artists over the past several weeks. Rod Argent: It’s so scary. It really is. People from that generation and Glenn Frey from the Eagles. I just couldn’t believe it! David Bowie, of course. It’s unbelievable. My close friend, John Dankworth, was married to the singer Cleo Laine. I remember about twenty years before thinking I felt so sorry for John. A lot of his contemporaries were passing away. I had none of those experiences, except with people like Hendrix. Now it’s starting to happen to my contemporaries. It’s very sobering. It really makes you feel old. You just have to think, “As long as I feel energized and well, I’ll want to keep going because it’s such a privilege to be at this age and be able to feel that you’re still at the top of your game.” Then you have all that energy coming back at you from the audience, reacting to new stuff we’re writing and putting out there, still being able to create and find a creative path forward. It’s a real privilege when you’re looking around you and seeing what’s happened to some of your contemporaries. People like Jack Bruce, who was a musical hero as well, has gone recently. Just so many. Melissa Parker (Smashing Interviews Magazine): Well, you are still going strong after about 50 years in the music business. Does the album title, Still Got That Hunger, describe why you’re still doing it? Rod Argent: Yeah it does. It was taken from “Chasing the Past,” one of the songs on the album which ironically is not about chasing the past. One of the lines in the song is, “Still got that hunger,” and it’s absolutely true. It’s what keeps us excited about playing. We love playing all the old songs. We honestly do. We’re not looking down on that at all, but only within the context of feeling that there’s a creative fast forward as well. There’s nothing that beats the excitement of hearing something on the radio that you’ve just written and recorded that you think sounds good. It’s lovely to hear the old stuff on the radio, but if you hear a new song and you feel it’s sounding good and people are reacting to it, that’s just as huge a thrill as it ever was. That’s what keeps you going. Melissa Parker (Smashing Interviews Magazine): Do the Zombies deserve to be inducted into the Rock and Roll Hall of Fame? Rod Argent: Does our induction depend on what I say here? (laughs) It would be absolutely lovely. Colin and I were talking about this the other day, and we’d be over the moon if it happens. But if it doesn’t, it doesn’t. It would be a wonderful honor. I don’t know who deserves it and who doesn’t. It’s not for us to say. Whenever I hear stuff that we’ve done and played, it just sounds like us to me. When Odessey and Oracle started getting more play, I thought, “It just sounds like us. I can’t listen to it objectively.” I just know it’s a joy to feel that the songs work and that they sound good. It’s for other people to judge really. It’s very hard for us to be objective. Melissa Parker (Smashing Interviews Magazine): What can fans expect from the 2016 tour? Most people think that “Hold Your Head Up” was written be me, but really 90% of the original idea of that song and the original writer was Chris White, the original bass player of the Zombies. So there’s a huge connection there. We play that, and you’ll get five or so tracks from the new album which we love playing. Melissa Parker (Smashing Interviews Magazine): Do you predict the Zombies will continue playing together for years to come? Rod Argent: As long as we feel good. We certainly do at the moment. But as long as we feel energized and continue to have a great time on stage, we’ll go on. Our audiences are growing, particularly in the States. It sounds completely bananas, but it feels like the Zombies are an emerging rock group (laughs). Here we are 70 years old, you know. We made six different Billboard album charts when this new album, Still Got that Hunger, came out, and Odessey & Oracle entered the charts also. That was the first time the Zombies returned to Billboard in about 50 years! Well, that really is extraordinary. « Lindsay Wagner Interview: "The Human Potential and Emotional Thing Has Always Fascinated Me"
Excellent interview. The questions concentrated on past and present ZOMBIES. Rod Argent responded without hesitation. He was articulate and informative. He did not show any signs of hesitation as he responded to each question. As for Melissa Parker, her questions dealt with present, recent past, and some history of the ZOMBIES. Some questions were repetitive; but Rod Argent was smooth during it all.